I am a 48 year old male. 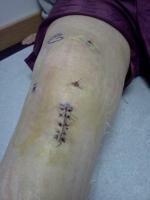 I had surgery for a medial meniscus tear on Feb. 26, 2008. It is now april 20, 2008. I still have problems bending knee while walking and can not do a knee bend when trying to kneel. Is this normal after this amount of time? I have been doing physical therapy.